The Avalon Astoria is a high heat output bay window stove producing over 45,000 btu.'s. It has a large hopper capacity of 115 lbs. enabling a maximum burn time of sixty seven hours without refilling. 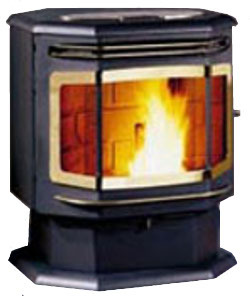 This pellet stove and fireplace insert is approved to burn a fifty percent corn/pellet mix. See comments below. The control board has a maintenance required diagnostic system which helps to analyse a problem if one arises. The neat pedestal plinth is part of the freestanding stove's body. The large ash pan has a built in handle for easy carrying. Heating Area 2,250 sq. ft.
Max. Heat Output 45,100 btu. Burn time Freestanding 67.5 hrs. Insert 52 hrs, see comments below. Window Size 22.5 in. by 12 in. Flue Vent Size 4 in. Rear Vent Height Freestanding 17.6 in Insert 16.9 in. 45 in. by 32 in. 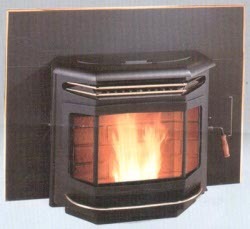 The hopper size of the fireplace insert is adjustable to accommodate smaller fireplaces. The size range is from 20 in. to 25.75 in. Using the small hopper size, capacity is reduced to 48 lbs. giving a maximum burn time of 28 hours. Ashes must be brushed from the firebox to the ash pan. The combustion air input must be adjusted manually to match the heat setting of the stove. If using a 50% mix of corn and wood pellets, the automatic ignition system may not work. This can be remedied by increasing the proportion of pellets in the mix. The Avalon Astoria has a 'maintenance required' diagnostic system on the control board. Clean the heat exchanger tubes, vacuum the hopper, remove fly ash from the upper baffles, clean gold trim surfaces. Sweep ash into ash pan and check if ash pan needs emptying. Clean the glass. Remove the firebox back, clean the back of the stove and the exhaust ducts. Clean the exhaust blower, convection blower and the venting system. If you would like to leave a review of the Avalon Astoria pellet stove or fireplace insert, please use the form on the contact page.